‘Torcolato’ is a DOC (Guarantee of Origin) wine of Breganze, a DOC area that extends for 15 km in the north of the province of Vicenza, in the middle of the Veneto region. Torcolato is a wine produced with dried grapes and belongs to the category of dessert wines, which are also called ‘meditation’ or ‘end of the meal’ wines. 85% of the grapes which are used belong to a local variety called ‘Vespaiola (the Italian word ‘Vespa’ means Wasp); the rest consists in ‘Garganega’ and ‘Tocai’. The name of the most used variety indicates that it is much appreciated by wasps, which, in certain years, can terribly attack vines, so that they make grape harvest difficult or even problematic. It seems that the peculiar scent of this vine attracts wasps, but the noticeable sweetness of juice, too, plays a decisive role. In order to produce ‘Torcolato’, only the best bunches, undamaged, ripe, open, are used, gathered and placed in a single layer, so that they can be carried without any damage. Then, they are chosen again and hung by means of strings at the beams of the attics. It seems that this system for preserving grapes gave its name to this wine. 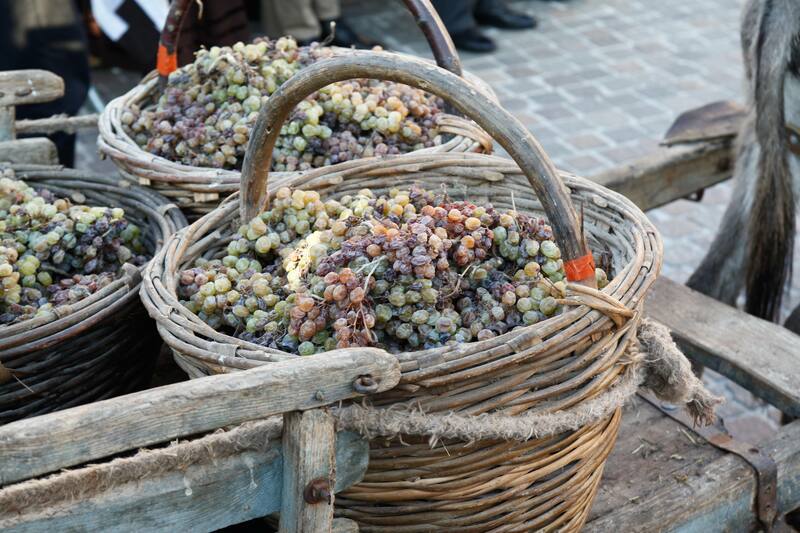 In order to hang them, the grapes are twisted, by winding them around a couple of strings. The operations of twisting, winding, in the local dialect were defined ‘torcolare’, and from this verb the name of the wine ‘Torcolato’ comes. It is important that either the attic or room in which the grapes are placed for five months, so that they can ‘rest’, is well ventilated. The grapes, while they wither, release in the air their water in the form of humidity which, with air circulation, must be removed. In this stage, Botrytis Cinerea in its form of grub, too, develop. It is the famous ‘noble mould’, which fosters the concentration of sugars and cooperates to create special scents and aromas that will be found in the wine. The meteorological situations of the period from October to January are crucial. It is important to open the windows in sunny days and close the whole room if the weather get worse. At the end of December or in January the grapes are pressed. The pressing operations only, with a very slow work which may require a whole day, produce the very sweet must. The yield is very low: from 100 kg of harvested grapes from 25 to 30 litres of liquid are obtained. After a decanting for removing the solid particles, the must is left to ferment in a thermally conditioned room. The transformation of sugars in alcohol is as much slow: it can last two or three months and is never complete. It naturally stops when the wine is still sweet. 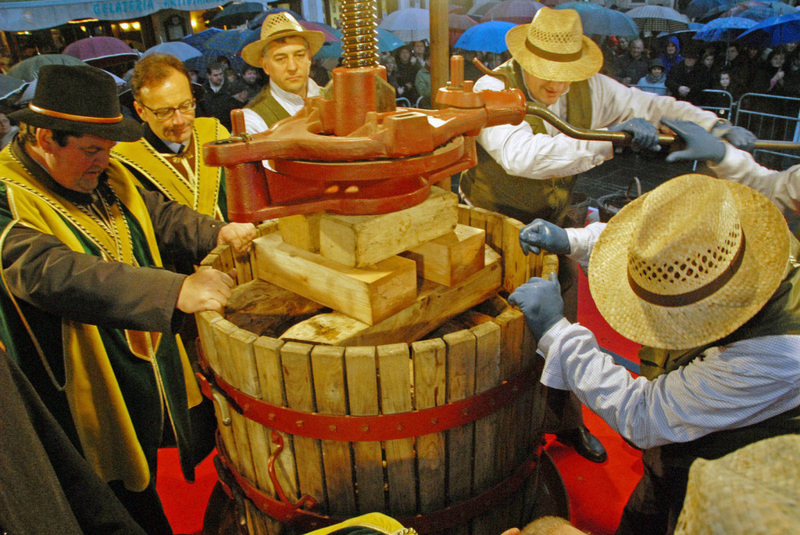 A second decanting is then carried out and the wine is left to mature in small barrels in oak. It remains there for at least one year, but, according to some producers, 24 months are the optimum period. 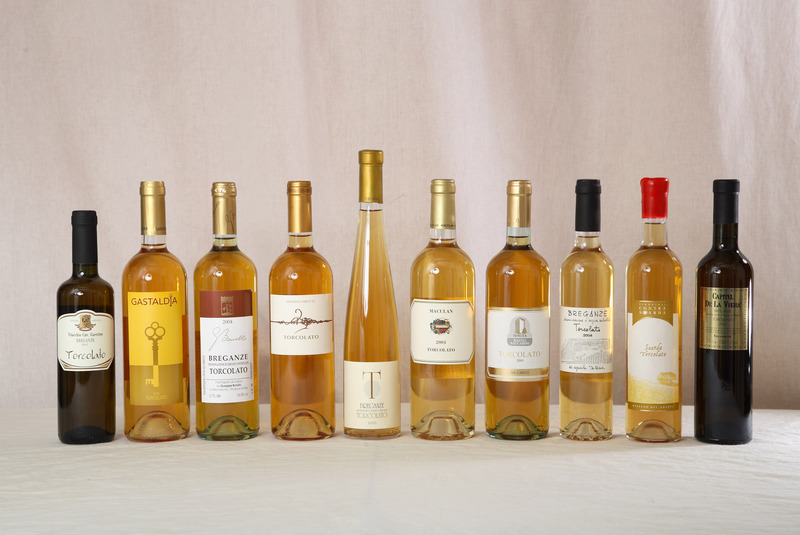 The wine acquires a golden yellow colour, getting rid of all its impurities, and results to be clear for bottling. The content in alcohol varies from 11 to 13.5%, residual sugars from 80 to 150 g a litre, acidity form 7 to 9‰. Breganze, a village located among the hills and tableland of ‘Pedemontana Veneta’, is preannounced by the thick bushes of the parks which surround the owners’ country-houses placed on beautiful hills, among which the elegant shape of the church tower, the second highest one of Veneto, stands out. The ‘Torri Colombare’ are more hidden, but have a relevant presence. They are characteristic of the landscape of Breganze. This is a DOC land, where unique wines are produced, such as DOC Vespaiolo and DOC sweet Torcolato, symbols of ‘Pedemontana Vicentina’. A road, too, was instituted in order to safeguard them, ‘La Strada dei Vini DOC Breganze (The Road of DOC Breganze Wines). 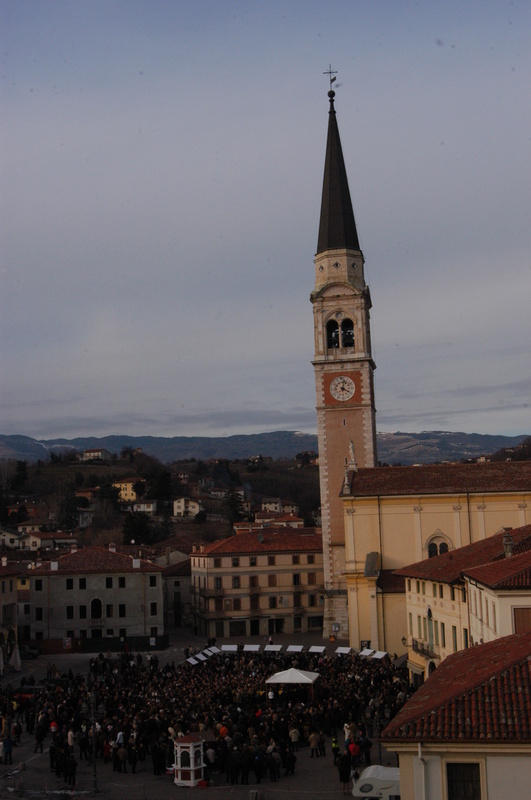 It goes from Thiene to Bassano del Grappa. Smelling a glass of this wine, intense aromas of honey, mature or dried fruit, such as raisins, fig, or even dried apricot are perceived. After a first sensation of pleasant sweetness, this wine lets consumer’s mouth dry and agreeably satiated. Pleasant fruity notes, which remind candied citrus, too, notes of vanilla and scents of agreeable woods are perceived. Its marked acidity moderates the sweet sensation, and the other way around. Its potential of ageing, too, is very interesting. A series of professional tastings showed that being twenty years old, for a wine, is not a problem at all. Even longer times can be faced by bottles coming from excellent years. ‘Torcolato’ is a so good wine that it can be drunk alone. Of course, it does not disdain biscuits or dry sweets. Another good combination can be done with cheeses, especially tasty, ripe, or even marbled ones. A more refined combination can be proposed with dishes prepared with liver, preferably bird’s one, such as duck or goose. Less traditional combinations, too, can be proposed: such sweet shellfishes as ‘scampi’ and lobsters, or such exotic cuisines as peking duck, a typical Chinese dish, or duck with orange.